We’ve been enjoying a nice spell of fair weather this past week and anglers have responded by making full use of the entire fishing grounds! We’ve been “grinding” the kelp beds at the major points for Tyees (and finding some) and doing the offshore drift to intercept those schools of feeding Coho, which are now getting into the 9-10-pound class. The guides are continually finding more halibut hotspots throughout the offshore waters. This week, we’ve had a number of expert “jiggers” mapping small pinnacles and other structure full of beautiful lingcod and groundfish. Between all of this fishing effort, QCL guests have found time to enjoy some spectacular humpback whale shows and even feed the odd sea lion in a rather up-close-and-personal kind of way! Never a dull moment around here! 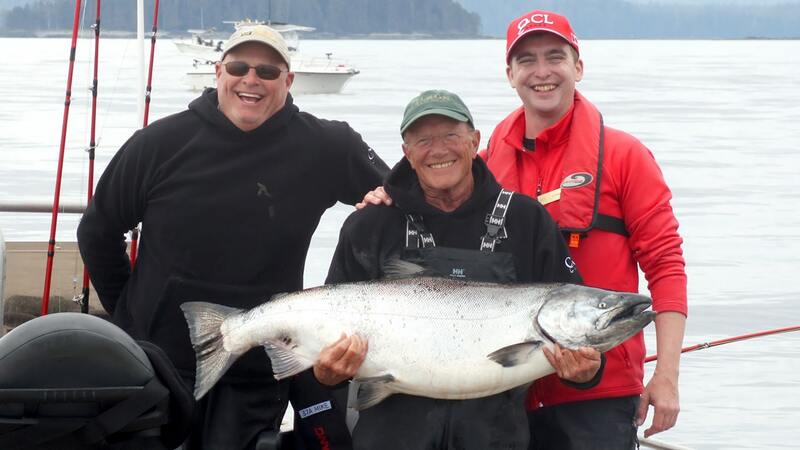 We celebrated our newest member of the QCL 50 Pounder Club this week with a great catch by veteran QCL guest Mike J, staying aboard the MV Driftwood. Mike and his fishing partner Dan were working the kelp around Cape Naden with QCL guide Griffin Barlow when the big one hit. 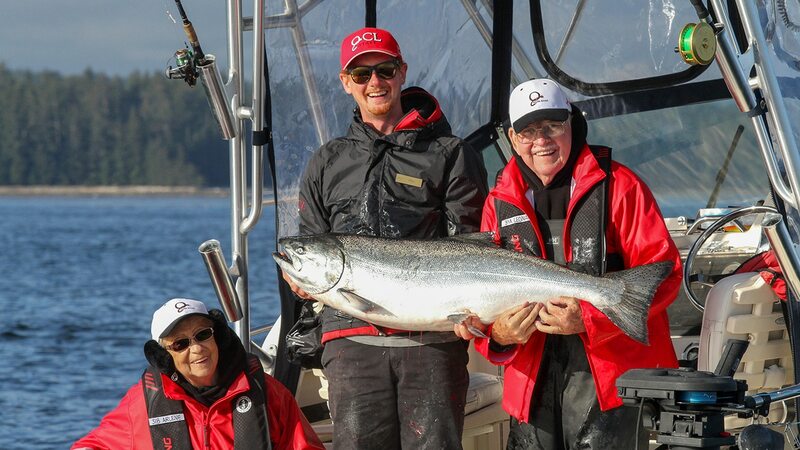 The fourth fish of 2016 in this exclusive club tipped the scale at just over 50 pounds and Mike celebrated with some mighty strikes to the ship’s Tyee Gong! While we haven’t seen huge numbers of Tyees so far this year, the big ones continue to show up pretty regularly in all of our favourite places! On Tuesday Leonard R boated a 46 pounder with his wife Arlene and assistance from his guide Oliver Massey. Later in the week we saw more fish over thirty with 35, 38 and 39 pounders boated on Thursday. Beautiful fish! Moderate north westerlies forecast for most of the coming week will bring sunshine and temperatures soaring to 19 or 20 degrees! It’s summertime in the Gwaii!